Obamas 'heartbroken' over Nigeria girls Jump to media player US First Lady Michelle Obama has said her family is "outraged and heartbroken" following the mass abduction of Nigerian schoolgirls. BBC Shorts: Malala plea for Nigeria girls Jump to media player Malala Yousafzai, the Pakistani schoolgirl who survived being shoot by Taliban insurgents, has said that the world must not stay silent over the abduction of more than 200 girls in Nigeria. Nigeria abductions 'outrageous' - Obama Jump to media player Barack Obama describes the abduction of girls in Nigeria by suspected Boko Haram Islamist militants as "outrageous" and outlines details of US aid. 'Security forces needed to free girls' Jump to media player Security forces or the police should be used to free more than 230 girls kidnapped by suspected Boko Haram militants in Nigeria, former UN chief Kofi Annan has said. Anguish at kidnap of Nigeria girls Jump to media player Nigeria's police have offered a $300,000 (£177,000) cash reward to anyone who can help locate and rescue more than 200 abducted schoolgirls. Nigeria kidnappings spark outcry Jump to media player The United States and Britain have condemned the abduction of more than 230 Nigerian schoolgirls by the Islamist group, Boko Haram, three weeks ago. Boko Haram 'to sell' abducted girls Jump to media player Nigerian Islamist militant group Boko Haram has threatened to "sell" the hundreds of schoolgirls it abducted three weeks ago. 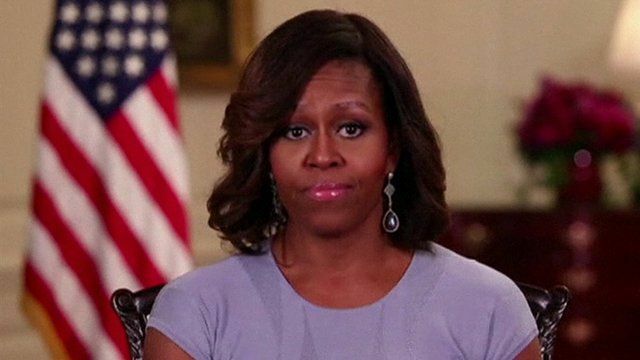 US First Lady Michelle Obama has said her family is "outraged and heartbroken" following the mass abduction of Nigerian schoolgirls. In an unusual move, Mrs Obama delivered her husband's weekly radio address to condemn the kidnapping as, "grown men attempting to snuff out the aspirations of young girls". Islamist militant group Boko Haram says it carried out the attack in north-eastern Borno state.